Group 0+/1 Isofix. Rear- or forward-facing. DescriptionISOFIX carseat for children from birth up to 18kgs. Rear- or forward facing (depending on age and weight). Installation with ISOFIX hooks and TopTether strap. Group 0+ position: rear-facing (from birth up to 13 kgs) up to 15 to 18 months. Group 1 position: facing the road (from 9 up to 18 kgs). It is however recommended to keep your child back to road as long as possible. Suitable for children from birth to 18 kgs (approx. 4-year old). Ensure car seats fits your car here! 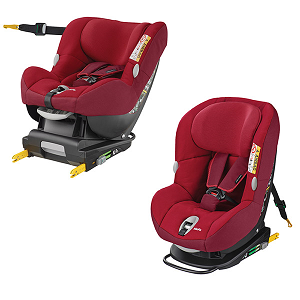 Read full instructions for Bebe Confort Milofix Isofix carseat. See Bebe Confort Milofix car seat installation video. Parents ask us to be able to rent an Isofix rear-facing carseat for the youngest children. We've selected the Bebe Confort Milofix carseat. Easy to install with its 2 Isofix connectors and TopTether strap, it can be used from birth up to 4 year old. With its pivoting Isofix base, it can be installed quickly rear- or forward-facing depending on age and weight of baby (it is however recommended to keep baby rear-facing as long as possible - up to 15 to 18 months / 13 kgs - rear-facing position been 5x safer!). With its Toptether strap, it can be set up in almost all recent cars. Comfortable with its padded seat and harness, your child will travel safe. "Very easy, fast and efficient communication, everything was like we agreed, Camille was super nice and really made sure all of our requests are filled, delivery was on time, all in all - great service with no complications, definitely for recommendation!"